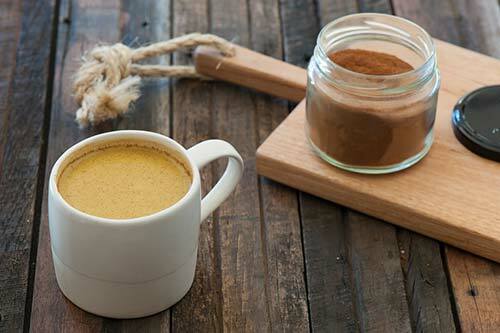 Before you even read the recipe, please consult with a professional medical practitioner about the risks of turmeric if you are on ANY medication. Turmeric contains the chemical curcumin. Curcumin and other chemicals in turmeric might decrease swelling (inflammation). Because of this, turmeric might be beneficial for treating conditions that involve inflammation. Ginger does not have an immediate impact, but may be effective at reducing the day-to-day progression of muscle pain. These effects are believed to be mediated by the anti-inflammatory properties. 1 Tbl Powdered Turmeric – Buy only the best and organic turmeric powder you can afford, I use this brand. ~Pour the water into a large sauce pan. ~Add the ginger to the water. Bring to a boil for 20 minutes then simmer for 20 minutes. ~Add the spices and ghee/coconut oil. ~Whisk to combine the spices. ~Stir while drinking this because the spices will settle to the bottom.